Say goodbye to losing metal pieces while you repair your electronics. 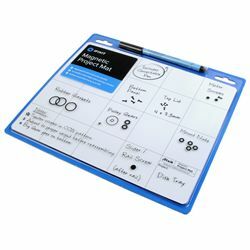 This 8x10 dry-erase magnetic mat catches and holds screws as you pull them out of a device. The included pen won't smear or wipe away like most dry erase markers, so if you brush your hand across the mat while performing a repair, the ink stays put. When you're finished, the eraser tip or a dry cloth wipes the ink away clean.